I feel very lucky to live within walking distance of a taverna which many consider to be Aegina's finest - named for the god of wine and the grapevine. 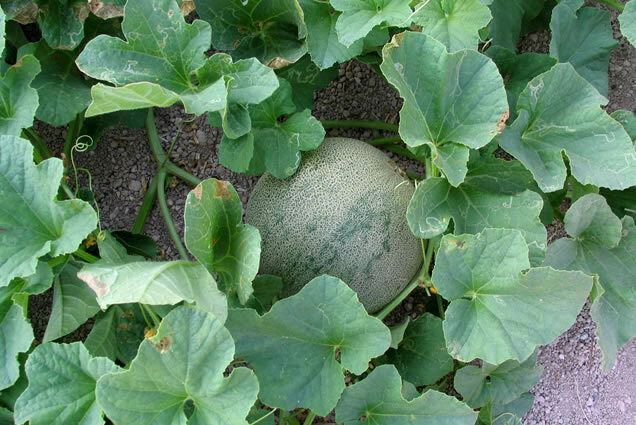 The Greeks usually call this god Dionysos, though the Romans called him Bacchus (hence, bacchanalian….). The wine at Vachos taverna includes both the house red wine and retsina. This fine, family-run, 32-year old taverna is located on the back road between Vagia and Mesagros, the road leading inland from the main seaside village of Vagia in the island's northeast corner. If coming from Souvala on the northern coast road, do not turn at the first intersection (signposted with arrows to Mesagros), but continue straight and go another few minutes and turn right after you go over the bridge. If you are on the road that goes to Agia Marina (which passes Agios Nektarios and then Mesagros village, turn left just after the gas station (at the signposted fork, which says Vagia) and you will see the taverna after a couple of minutes on your left). 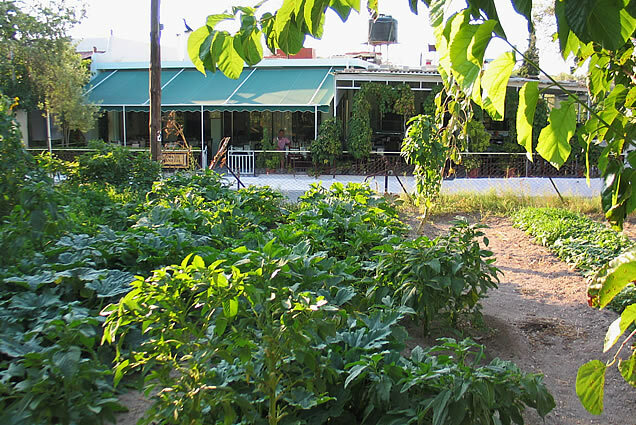 Across the road from the taverna is the impressive ¾ acre (3 stremmata) vegetable (& fruits) garden whose produce supplies the taverna during its busy summer-fall months (and the family during winter). 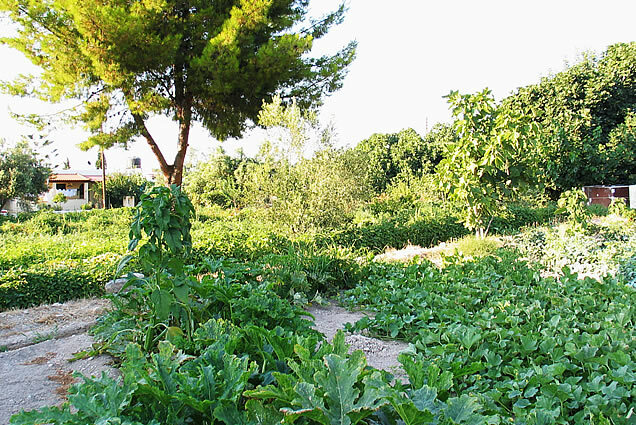 The vegetables (& fruits) are organically grown, with manure the only fertilizer used, water supplied (copiously) from the well which sits beyond the taverna veranda. 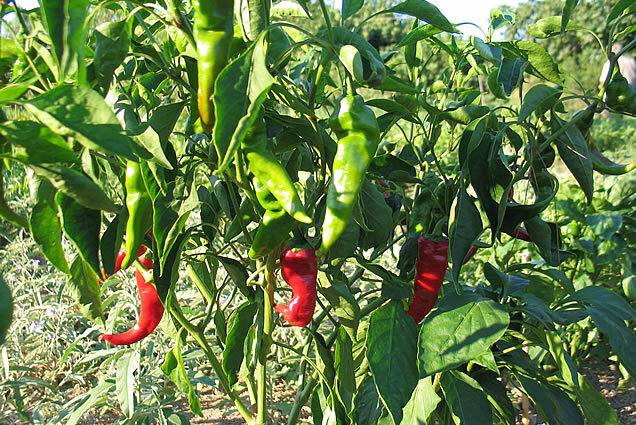 There are tomatoes, cucumbers, peppers, zucchini, eggplant/ aubergine, melons, figs, vlita (a variety of amaranth grown for its leaves, which are boiled and served hot or cold with oil, salt, lemon or vinegar and sometimes chopped garlic). Giorgos Kommatas, who is now 63, informed me that the water from this well was potable when he was a child, though it later became brackish and is now suitable only for irrigation. 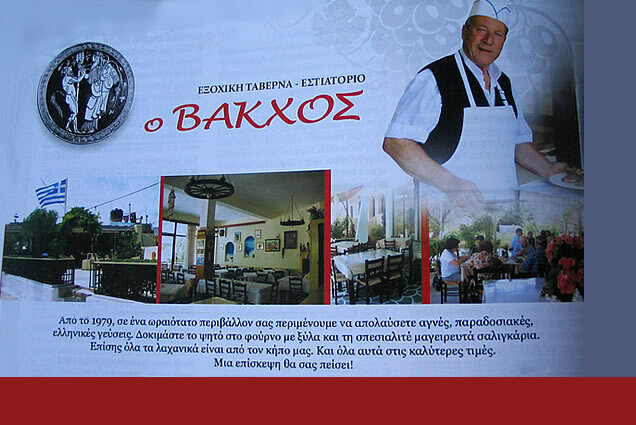 Giorgos worked as a steward on a cruise ship from 1964-80, and opened the taverna in '79. He and his wife, Chrisoula were both born in Mesagros; their son Nikos, 30, now owner of the establishment, attended both Greek and Swiss cooking schools and is a certified chef. Chrisoula learned to cook from her mother. She and Nikos are the main chefs for all except the grilled meats and Nikos also waits tables along with Robin and Yianna. 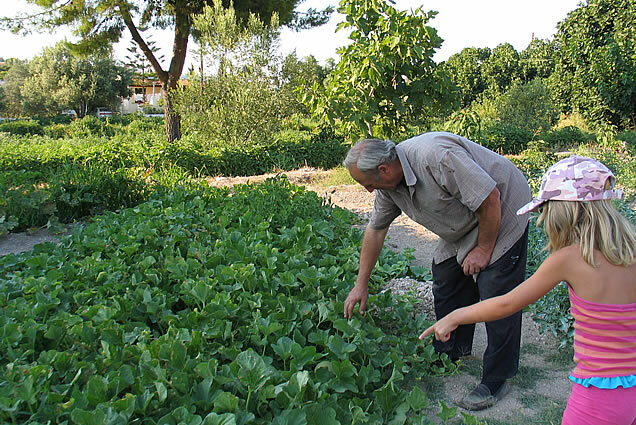 Though Nikos is now technically owner, the whole family works together, assisted by by several employees. 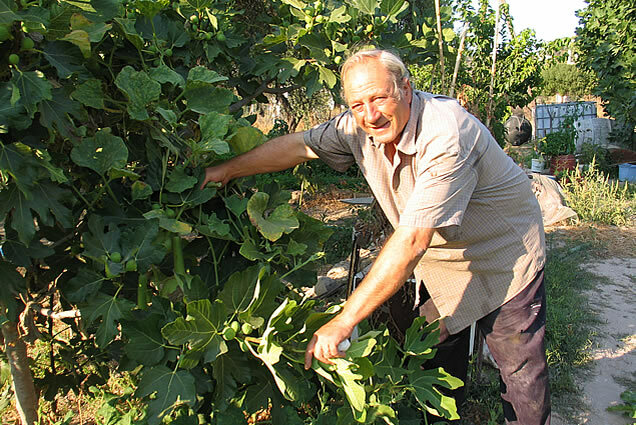 Giorgos starts seed in his makeshift greenhouse at Christmas, and plants the seedlings around Pascha (Easter), in early April. The seeds are his own as he saves seeds from his plants, and he has given me plenty of them, along with seedlings from his greenhouse (though his soil is far better than my own and do better in his garden). This year he added 300 sacks of manure to that soil. 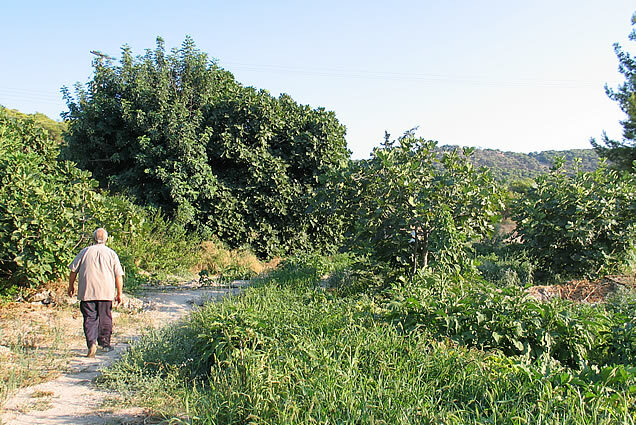 He spends hours each day watering, in morning and evening, and can be seen bringing produce to the kitchen across the road as needed. When the taverna is in full swing, Giorgos is busy manning the schara (grill), turning now and then from the fire to beam his twinkling blue eyes at old customers and especially at small children, whom he loves. He is a big man, and his white chef's hat makes him even larger. Like all the family and assistants, he is courteous and friendly to all, and much loved by those who know him. 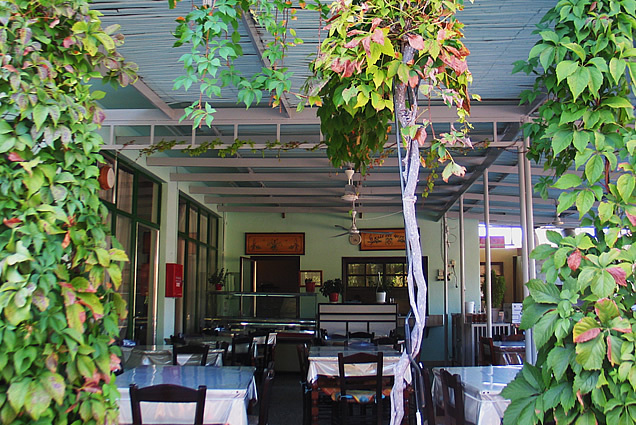 Service is very prompt, the taverna always clean, and the large open veranda seats large numbers of people. It is open 8 months of the year, from the end of March until late November. 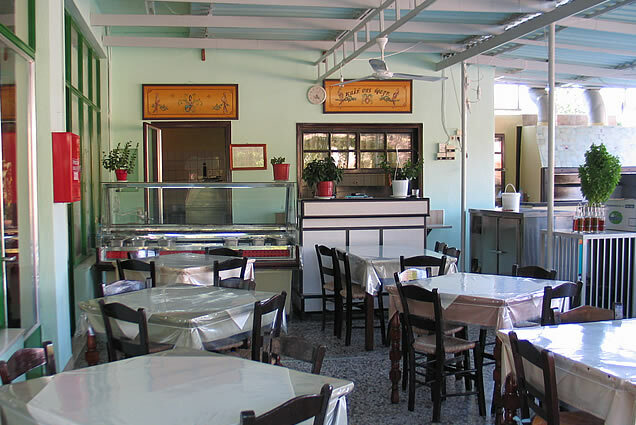 Though many customers come from Athens and Piraeus, the clientele is international, and one will sometimes hear French, English, German, Italian and other languages spoken at the tables along with Greek. Some of the hotels send their customers here. I asked Giorgos about the taverna's specialties, and he told me to mention saligaria (snails), moussakas and rabbit, though the menu is very large, and includes many appetizers and salads as well as main courses. One which I especially enjoy is kokkoras (rooster) in a light tomato sauce. The place really fills up during high season at both mesimeri (midday, meaning up through late afternoon) and late evening. Wonderful Easter food is served both after midnight when the Lenten fast ends, and on Easter Sunday - including the traditional mayeritsa (tripe soup served to break the fast) as well as delicious, succulent lamb. I asked Giorgos about tips, as I have never known what to tell foreign visitors when they ask what is appropriate in Greek restaurants. He told me that he considers tips totally optional, as he pays his workers, though certainly it depends on the customer if she/he wants to give something extra. For reservations call Vachos taverna at (+30) 22970 71084 or (+30) 22970 71767. If you are on the road that goes to Agia Marina (which passes Agios Nektarios and then Mesagros village, turn left just after the gas station (at the signposted fork, which says Vagia) and you will see the taverna after a couple of minutes on your left). If coming from Souvala on the northern coast road, do not turn at the first intersection (signposted with arrows to Mesagros), but continue straight and go another few minutes and turn right after you go over the bridge.